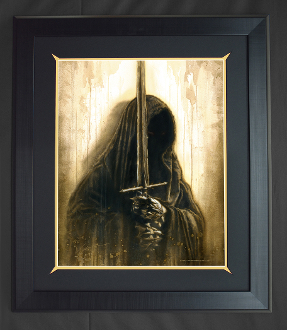 The Ringwraith is now available fully framed for both Canvas and Paper giclees. The Canvas Giclee has been hand-varnished and signed by myself, the artist, utilizing Breathing Color's archival Lyve Canvas. The approximate framed Canvas outer dimensions are 24 x 31 inches.This complete, fully framed canvas has been gallery wrapped ( stretched ) into an Matte Black floater POLY frame, sealed in the back with a paper skin. Complete and ready to hang, with hanging wire and certificate holder.Shipped right to your door in a box with extra cardboard innerpacking and poly corner protectors. The Paper Giclee utilizes archival paper by Breathing Color. The approximate framed Paper outer dimensions are 26.5 x 30.5 inches. This complete, fully framed Paper Giclee has been mounted into an Brushed Black POLY frame, sealed in the back with a paper skin. Double matted in themed,appropriate colors,including installed acrylic glass. Complete and ready to hang, with hanging wire and certificate holder.Shipped right to your door in a box with extra cardboard inner packing and poly corner protectors. Please note that framing these pieces are a custom job, which requires a minimum of 2-3weeks to complete.